I created this recipe using leftovers from a turkey dinner. Since it was a big hit, I posted it at Gail’s Recipe Swap where, to my surprise, it became a featured recipe. You can add or substitute anything you’d like. Measurements are approximate because I just used what we had on hand at the time. 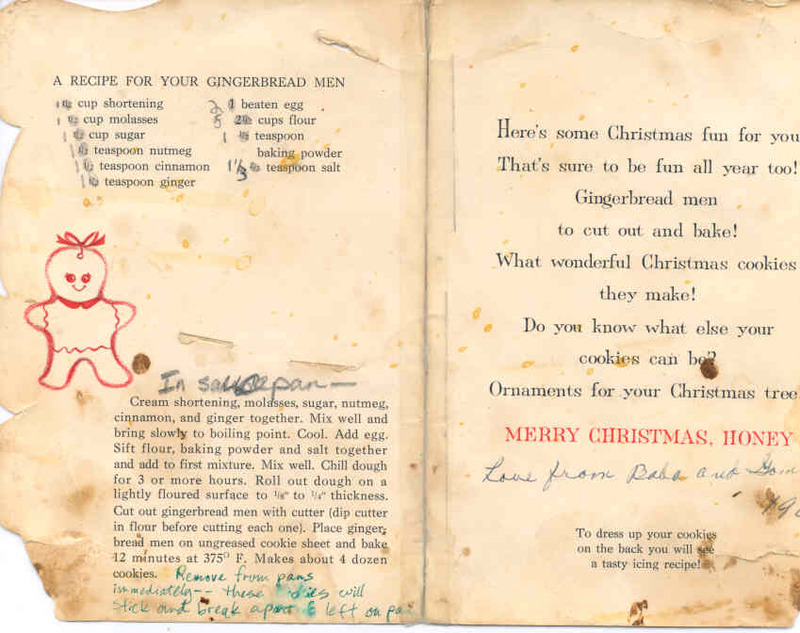 This recipe is printed on the inside of a Hallmark Christmas card my grandparents sent to me in 1964. The card included a plastic cookie cutter (like Tupperware, but not) which attached through the slots on the front of the card (shown at right). 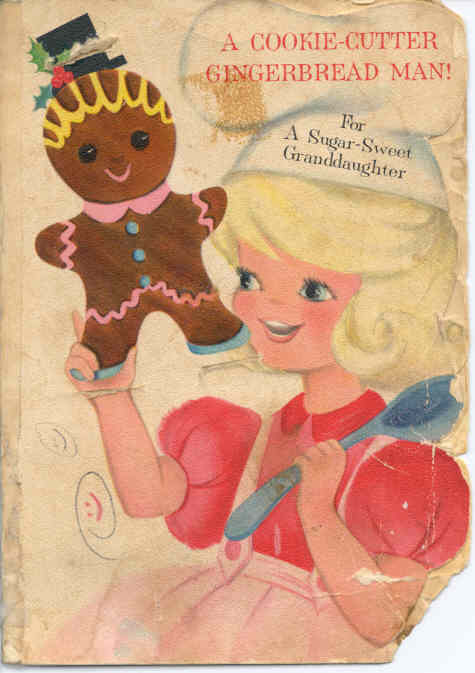 The cookie recipe was printed on the inside of the card, and the icing recipe was printed on the back. We made the cookies every Christmas almost every year since then. We would decorate them in intricate little outfits — overalls with striped t-shirts, bathing suits, shorts and shirts w/caps, the works! — and hang some of them on the Christmas tree. Our Beagle, “Dilly”, ate the cookies hanging at the bottom of the tree, leaving their heads dangling from the branches. During most of my growing-up years, we lived next door to the ultimate back-door neighbors. Both homes were built by the same man in the mid-1920s. He lived in the house where I grew up, while his own parents lived in the house he built next door. He installed a gate in the fence between the two patios. Since my parents purchased the home in the late 1960s, they’ve been blessed with friendly neighbors who continued to appreciate this easy passage between patios. The first neighbors were terrific entertainers and were hilariously funny. 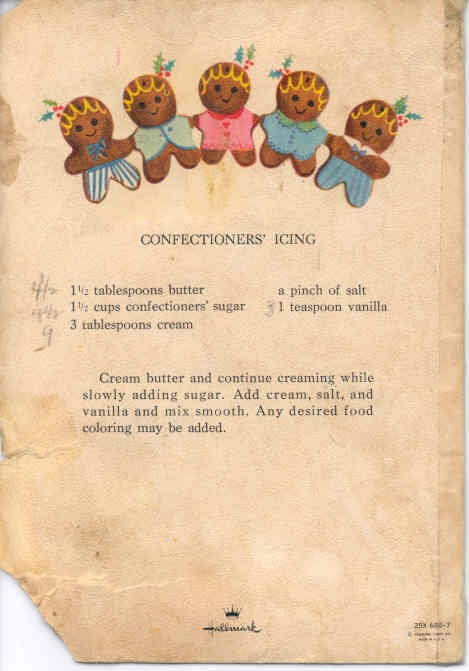 This is one of their favorite recipes which they shared with my mom, who still makes it from time to time. Those neighbors have since moved on, but the new neighbors are every bit as terrific and just as much fun. 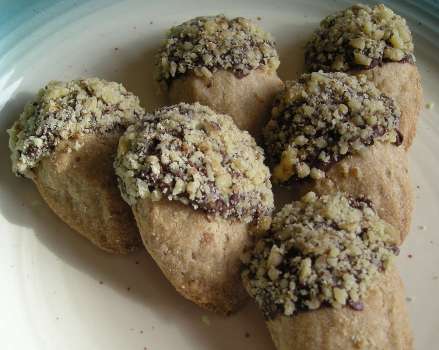 In Jim’s family, the Christmas cookie tray isn’t complete without Walnut Acorn cookies. These are super easy to make, and their unique shape and appearance make them an attractive contribution to a cookie exchange party or cookie platter. We found this recipe on an old, yellowed index card, tucked away with other family recipes in a forgotten box on a high shelf in our kitchen. The card includes the following note: “May be frosted with a banana frosting or eaten plain.” Either way, it’s delicious. We love the rich, moist texture and robust banana taste, and agreed that it needs no frosting. This is where I share our family's tried-and-true long-time favorite recipes, as well as some new favorites. We hope you'll enjoy them as much as we do.